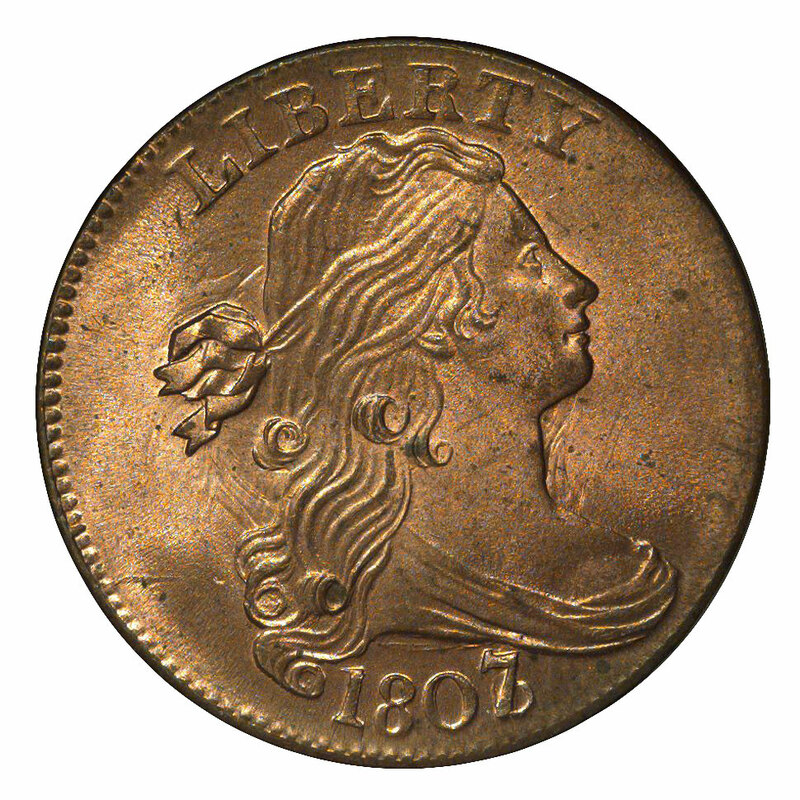 The Draped Bust of Liberty was introduced to the cent in July of 1796 and was transitional with the Liberty Cap obverse for that year. Cents of this type continued in production through 1807, though the number minted varied from year to year. The most common date in overall numbers is 1798, while the ones most often seen in mint state are certain varieties dated 1796 and 1797. These uncirculated cents come from the famed Nichols Hoard, and they account for the coins most often selected by advanced type collectors. Since mint state examples of early date cents are beyond the budgets of most shoppers, I'll leave their grading subtleties for the specialists to discern. 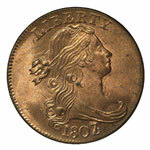 This review will concentrate instead on the grading of Draped Bust cents in circulated condition. Coins of this design were often weakly struck, and made on poor quality planchets. The characteristic traits listed here to assist in grading must not be confused with actual wear. 1796 S-94 Planchet is usually rough. 1797 S-121 Central hair is flat. 1798 S-185 Obverse is weak. Reverse is very sharp. It's easy to see how a person armed with this knowledge has a distinct advantage over one attempting to grade such coins by the "one size fits all" method. The basic grading guidelines were written for coins that are sharply struck from fresh dies, are well centered and are free of planchet problems. These conditions rarely exist in unison with early United States coins, and both collectors and dealers frequently have to contend with one or more complicating factors when arriving at an overall grade for a particular cent. The rarity of many of the early cent varieties means that only specialists will have to navigate around their specific peculiarities. The typical collector or dealer is concerned primarily with just a small number of relatively common varieties suitable for type collections. Unlike later coin series, in which grading is often determined by specific features, such as the number of letters visible in the word LIBERTY, early cents must be graded by overall wear and surface condition. This is because the dies were often improperly hardened, causing them to sink at their centers when placed into use. The resulting concavity caused the cents struck from such dies to be weakly struck at their centers. In other instances, dies worn at their peripheries created cents with strong centers and weak borders. While some of the 1796-97 hoard cents are notable for having borders with prominent and well formed denticles, most of the varieties within this series rarely display such distinct borders. The bottom line is that collectors seeking a type piece or two should look for varieties that are both common enough to be affordable and usually found well struck. 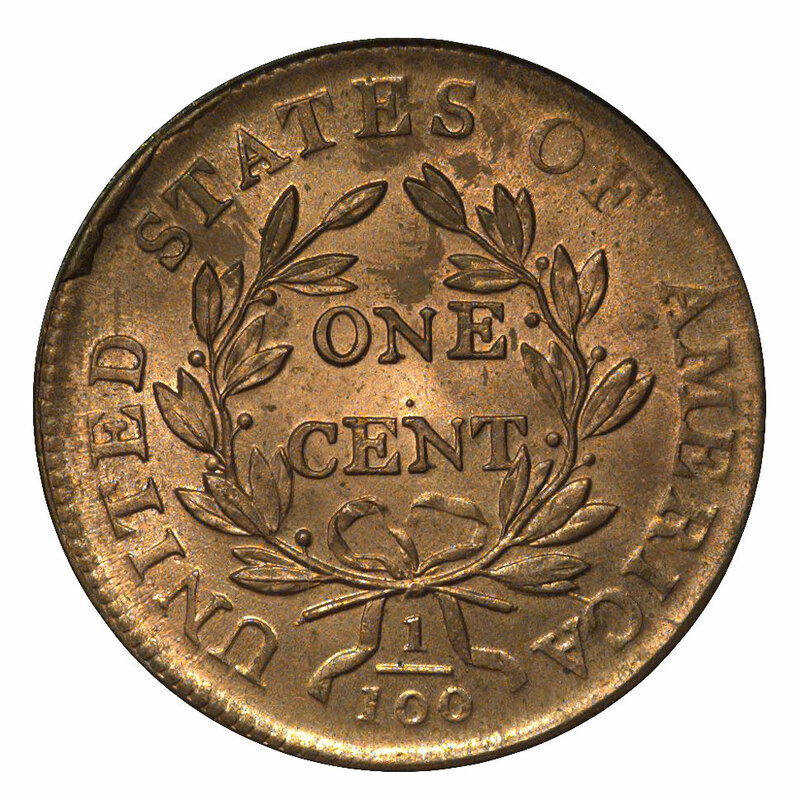 Some good examples include the early die states of S-138 and S-139 (1797), as well as S-161 and S-187 (1798). Generally speaking, the cents dated 1800-07 are not as suitable for type coins, due to worn dies and irregular striking quality.